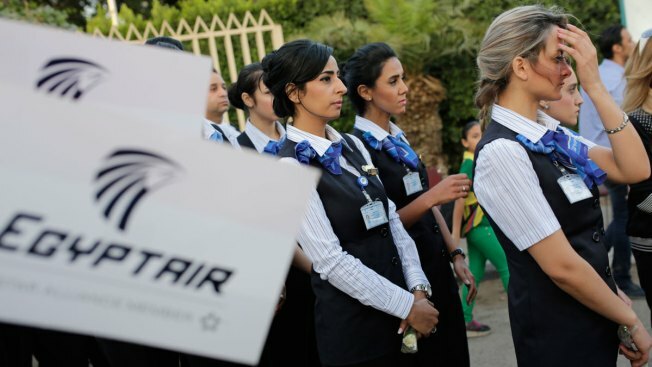 EgyptAir hostesses line up during a candlelight vigil for the victims of EgyptAir flight 804 in Cairo, Egypt, Thursday, May 26, 2016. A French ship has picked up signals in the Mediterranean Sea believed to be from black boxes of the EgyptAir plane that crashed last month, killing 66 on board, the Egyptian committee investigating the crash said Wednesday, NBC News reported. The committee said French naval vessel "La Place" had received signals from the search area which are assumed to be from the plane's data recorders. The development was confirmed by the French investigation agency, BEA, which said the signals were detected from the seabed in the wreckage search area. Spokesman Sebastien Barthe told NBC News the signal had been detected on the vessel by a private contractor, Alseamar. There have been a series of conflicting reports in recent days regarding whether new signals have been received. EgyptAir Flight MS804 crashed on May 19 while en route from Paris to Cairo.